Good news everyone! Bembelbots attended “Innovative 2009″. 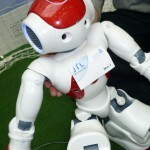 The RoboCup AG will attend the Night of Science at campus Riedberg. See our humanoid soccer robots in a special robot show, learn about the RoboCup contest, and talk to the RoboCup AG team members! You will find us on Friday, June 19 from 16:30pm to midnight at the foyer of the geoscience building. The JRL web page has been ported from Mediawiki to WordPress. JRL aims at teaching students on complex autonomous systems. See the Teaching page for form information on our lab courses.